1. Lightly oil a soap mold (you can use an ice cube tray or cups). Next, place your toy bugs face down in the mold. 2. Melt glycerin soap in the microwave. Squirt yellow food coloring in, or mix yellow food coloring with a teeny bit of red or orange to get more of an amber color. Once you have your desired hue, add the food coloring to the melted soap and stir. 3. Pour your melted, colored soap into the mold on top of your bugs. Let set and then pop the soap out of the mold. 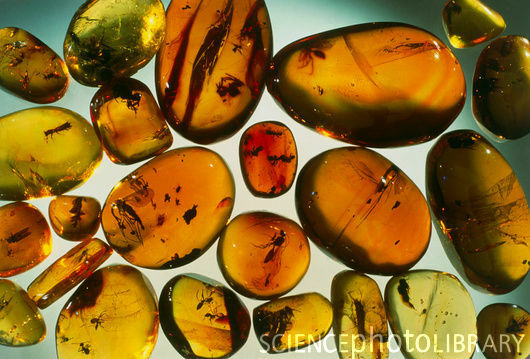 Now, you have your very own amber fossil with an insect encased inside!